On the sultry afternoon of April 1, Delhi chief minister Arvind Kejriwal rose to deliver his first campaign speech for the capital’s municipal corporation elections. The venue was Gautam Vihar Chowk, an area with many unauthorised colonies in Shahdara that’s considered a pocket burough of his Aam Aadmi Party (AAP). People must have been wondering what he would open his speech with, for this was his first rally after the dismal AAP performance in the Goa and Punjab assembly elections, where he had himself led the campaign. 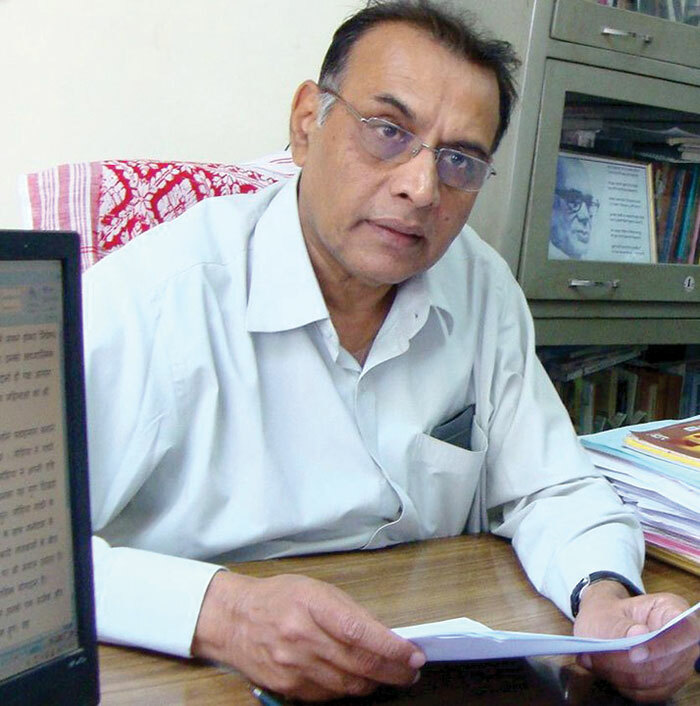 He was in his usual white bush shirt and black trousers, and harped on his usual theme: the problems faced by his government because of non-cooperation by the Narendra Modi government at the centre and the BJP-led municipal administrations. He also spoke of the problems created by the BJP governments in Chhattisgarh, Madhya Pradesh, and Modi’s Gujarat. The Modi-Kejriwal antagonism has always been about two different kinds of populism. While it may not play out in a municipal election, the fact remains that a Kejriwal chastened by Goa and Punjab faces a mid-term test in the municipal elections. For a politician harbouring intentions of becoming a prime minister, it’s ironical that municipal elections may prove a test of his political viability. It’s only April, and the temperature in Delhi is already nearing 40 degrees Celsius. As the municipal elections approach, the politics is heating up too. When the political startup AAP, in its second attempt, won 67 out of 70 seats in February 2015, he had stunned Modi at the height of his popularity with the biggest victory in Indian history (after Sikkim 1985 and 1989). In the election campaign, he had projected it as a battle between him and Modi. The prime minister had failed to win more than three seats even after addressing a series of rallies. Kejriwal was then seen as the top challenger to Modi, ahead of Nitish Kumar – not to mention Rahul Gandhi, in the 2019 Lok Sabha elections. However, close to the half-mark through the term, Kejriwal is battling for survival. An image of a street-smart politician preferring constant confrontation with rivals suited him once, but not today. With its forays in Punjab and Goa coming a cropper despite anti-incumbency, AAP’s plans to fight elections later in Madhya Pradesh, Himachal Pradesh and Rajasthan have suffered. The party is limping back, and prospects in the municipal elections too seem grim. AAP had fought the elections in Punjab and Goa on issues like farmer suicides, the might of the land mafia, unemployment and the flourishing drug trade. It fielded some prominent faces too – stand-up comic Bhagwant Mann, leading advocate HS Phoolka, Jarnail Singh and Himmat Singh Shergil, all of whom lost. Its high-pitched campaign spoke out against demonetisation and the Akali-Congress ruling elite. But the Congress won, though its vote share fell from 24.4 percent in the 2014 Lok Sabha elections to 23.6. AAP’s vote share was less than SAD-BJP’s 30.4 percent, though it won more seats. The municipal polls for all 272 wards of Delhi are scheduled for April 23 and counting would be done on April 26. For AAP, the going will be tough despite the BJP facing anti-incumbency, according to most observers. For AAP, Delhi civic polls are nothing less than a battle for survival. A rejuvenated BJP is going jugular. Party president Amit Shah is overseeing its preparations, and has addressed a rally too. 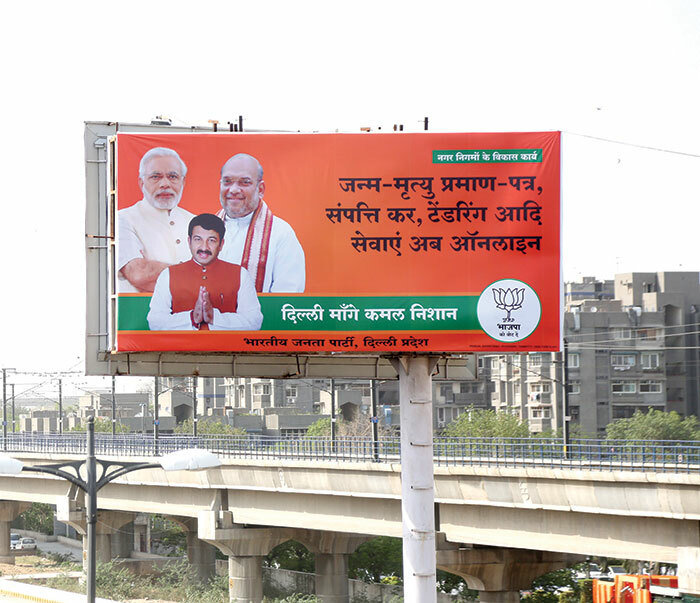 The party’s radio advertisements tell the voters that only Modi can set Delhi right. This might be the first time in recent memory that the PM’s name is used in this fashion in civic elections. 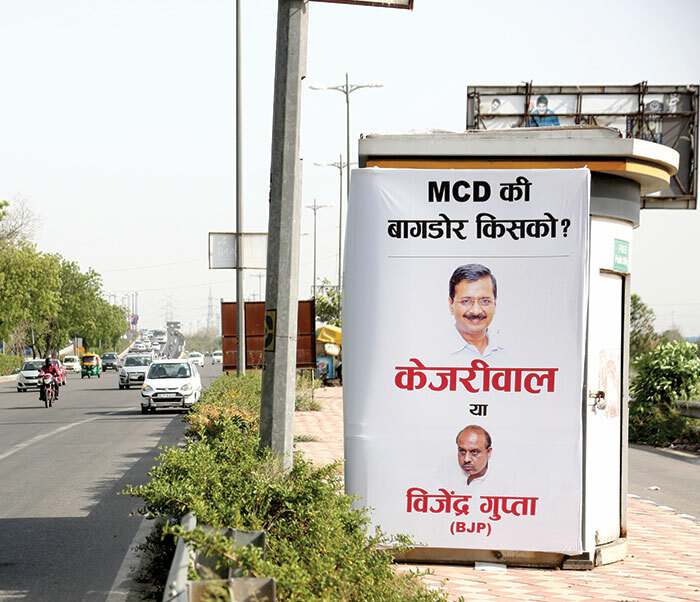 No wonder, Kejriwal has changed his tune and billboards now project Vijender Gupta, the leader of opposition in the Delhi assembly, as his rival. But the party’s (and Kejriwal’s) connnection with the aam aadmi has suffered a dent. For despite holding the post of chief minister, he was nowhere in the picture when the capital was going through emergencies like the outbreak of chikungunya and dengue last year. The mohalla clinic project, much vaunted by AAP, hasn’t been implemented in earnest. Its ministers, leaders and MLAs have been named in criminal cases. What’s worse, the findings of the Shunglu report are being flung at AAP by the BJP and the Congress. There are structural issues as far as the Delhi government goes, whereby an elected state government has to defer to the lieutenant governor appointed by the centre and decisions it takes independently can be questioned. The supreme court too had ruled that the LG held primacy. Without a broad picture, the Shunglu committee’s findings that the AAP government has erred can be used to show Kejriwal and deputy chief minister Manish Sisodia in bad light, though it is not as if they have indulged in corrupt practice. Kejriwal has cried foul and alleged the report is an attempt to get Sisodia arrested around election time, instead of attempting to explain the intricacies. So it’s back to populism for Kerjriwal. This time, the party is announcing a waiver of property tax in residential areas. In 2015, it had announced huge concessions on water and electricity bills, which translated into votes. This time, the party’s ship tries to find a course between the lower income groups, who do not have to pay property tax and the middle and higher income groups, largely BJP loyalists, who may be lured by Kejriwal’s bait. While Kejriwal’s image as an anti-corruption crusader has been losing its sheen over the last two and a half years, prime minister Modi’s has emerged stronger after the massive victory in Uttar Pradesh, as also the victories in Uttarakhand, Goa and Manipur. Those wins seem a big threat to Kejriwal’s – and AAP’s – chances in the civic polls. Riding on them, the BJP’s poll pitch for the municipal elections is ferocious. It has barred sitting councillors and their kin from contesting and is fielding new faces to pre-empt charges of corruption faced by councillors and hence, in a way, anti-incumbency. That may sound a trifle overconfident, but it does show how AAP’s reach and strength stands curtailed. After the Punjab debacle, all is not well in AAP. Leaders and workers are showing signs of restlessness and disillusionment with the top brass, chiefly Kejriwal himself. Recently, AAP MLA Ved Prakash, of Bawana, resigned to join the BJP. “There’s huge unrest,” he says. “Some 30-35 MLAs are unhappy with the party leadership. They had promised more teachers, free WiFi, CCTVs – none of which has turned into reality. Corruption too has not gone down. There’s corruption at every level in the government. What is even worse is that the high command is unreachable and MLAs do not have a voice of their own. 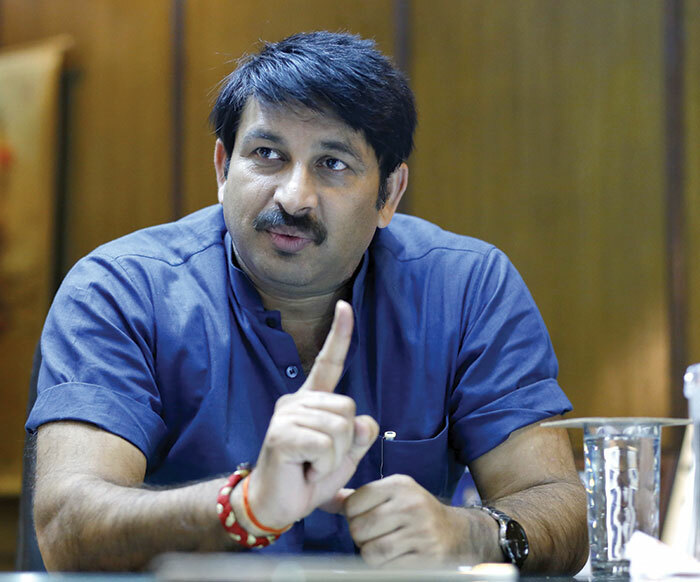 I have not been able to seek time from our party high command [Arvind Kejriwal] for a long time.” MLAs like Devender Sehrawat, a retired colonel and Pankaj Pushkar are estranged from the party. 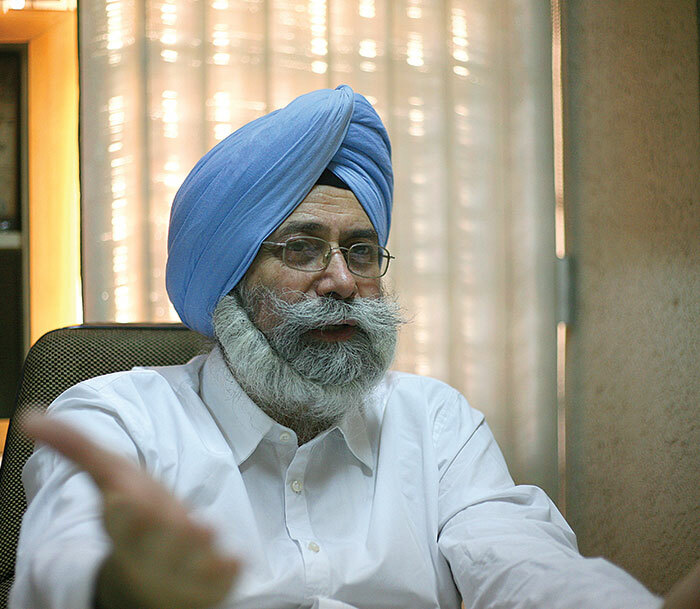 Seconding Ved Prakash, Sehrawat says the party has become a one-man show with no place for discussion. At the grassroots, some workers are thinking of joining Swaraj India, while many have already joined the BJP. Swaraj India, launched by breakaway AAP leaders Yogendra Yadav, Prashant Bhushan and Anand Kumar, may not be able to establish a presence in this election, but it certainly will cut into AAP votes. The question, therefore, remains: Will Kejriwal manage to prove that AAP is still a force to reckon with? The MCD election seems to be boling down to a fight between the AAP and the BJP. How do you rate the chances of AAP? I don’t see any prospect for AAP in Delhi civic polls. The AAP government has been thoroughly exposed during its two-year rule, which was marked by corruption, loot of public money and complete non-performance. AAP’s drubbing in Punjab and Goa elections is a testimony to this. Also its indictment by the Shunglu committee has brought to fore its falsehood. What are your promises to people in the civic polls? We are contesting the elections on the plank of good governance as shown by PM Narendra Modi. Removing corruption, better sanitation and health facilities in Delhi are the topmost priorities for BJP. All MCD offices will be made fully digital leaving little scope for corruption. What advantage does the BJP have over AAP in MCD elections? The BJP’s resolve to fight corruption makes us the favourite of Delhi’s voters. We have fielded all new candidates. This is unprecedented and is primarily aimed at scuttling charges of corruption [leveled against the incumbents by AAP]. It is a cleanliness drive. BJP is the only party committed to zero tolerance of corruption. In case the BJP wins civic polls a third time in a row while AAP rules the state, do you think the friction between the civic bodies and the state government will continue? The intentions of the AAP government are clear; the party is least interested in running the government. It’s only interested in indulging in frequent fights with the centre and the civic bodies. Our effort will be to work with the Delhi government as civic bodies are dependent on it for funds. What is the most important issue for you in this MCD election? Our main focus will be on rectifying the system and making MCDs self-reliant. They cannot meet the expectations of people until and unless they can generate their own funds. It is very important for the MCDs to be out of debt and be self-sufficient. Secondly, massive corruption has taken place under the nose of BJP in last 10 years; we will order a probe into these cases if voted to power. Who do you see as a bigger competition: AAP or BJP? Our competition is only with BJP, not AAP. We are not under any pressure; AAP has lost its ground in Delhi in the last two years. Their intention in Delhi was not to govern and have failed miserably. They have already lost the plot in civic polls. What do you think went wrong with the AAP's model of governance in last two years? The fact that they capitalised AAP's victory to spread their political wings across the country left Delhiites in a lurch. As a result, we have an absentee chief minister in Arvind Kejriwal who shows no interest in governing Delhi. His political ambitions are too high and have overshadowed his interest in governing the capital. The Congress lost in UP, Maharashtra and Odisha. Do you feel under pressure in the upcoming MCD elections? No, we are not. It is the AAP government that should be in pressure. A month after your party lost elections in Punjab, where do you believe the AAP is headed? Though we were not able to form the government (in Punjab), AAP has managed to create history. Ninety percent of our MLAs are first-timers and yet they are the main opposition party in the house; it’s a big achievement. So, today we have our government in Delhi and we are the key opposition party in Punjab. That means we are making a difference. During the campaigning (in Punjab) and after the formation of the (Congress) government, people have realised that AAP is there to bring about a change. AAP didn’t fare as per everyone’s expectations in Punjab. Don’t you believe that this will affect your party’s chances in the MCD polls? Unlike the state elections, the corporation elections are fought on local issues; therefore the two (processes) are very different. We cannot compare the Punjab mandate with MCD elections; we should see both differently. What are the chances of AAP in the MCD polls? Also, after Punjab are you still thinking of foraying into other states? People in Delhi feel cheated by the MCDs as these have turned into dens of corruption. The fact is that the MCDs’ decisions make a big difference to the lives of people in Delhi. Only AAP can check this corruption. AAP is setting its foot in other states and we are hopeful of our strong presence everywhere. With the AAP MLA Ved Prakash joining BJP and several party members shifting their loyalty to either BJP or Swaraj India, are things changing within AAP? The AAP is fighting for the ideals as it was when the party was conceived in 2013. We are committed to zero tolerance for corruption. The AAP government has been accessible to the people. The fact is that the AAP government has faced a lot of pressure from BJP and Congress in the last two years. Frankly, no government has been targeted the way AAP government has been. Yet it’s facing and fighting them boldly. 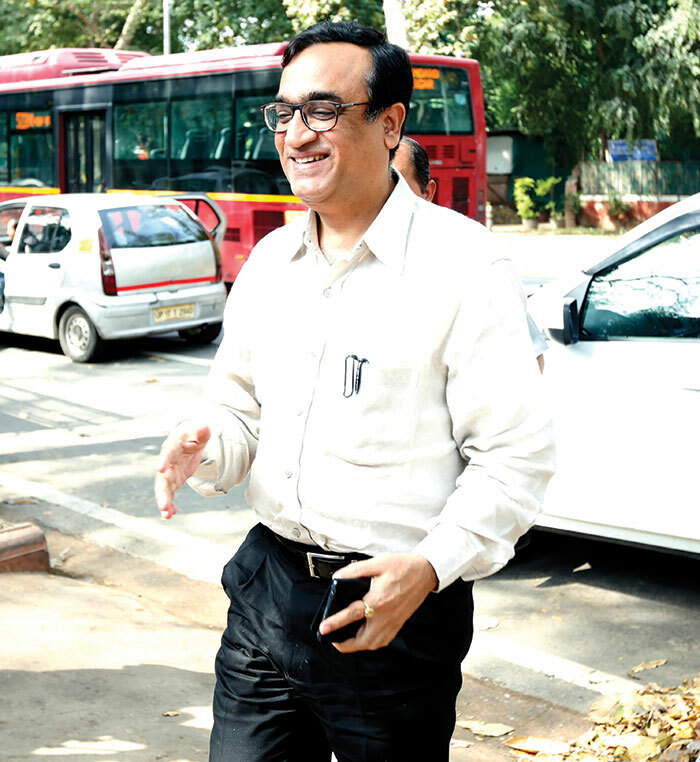 The Shunglu committee report has pointed out gross irregularities in the functioning of the AAP government. What do you have to say on that? The Shunglu committee report nowhere points out any corruption done by the AAP government, it only talks of irregularities and procedures not being followed. This is at best a political agenda by the rival parties against us before the elections. Swaraj India’s will fight its first ever elections. What are your chances? We will fare well. The BJP has been associated with non-performing MCD and AAP with non-performing government. We surely have some disadvantages like not having a party symbol. Also we don’t have money for campaigning. But we had started campaign early as we were the first party to release the list of candidates. This has given us an upper hand. Swaraj India has come out of AAP. Will your party eat into AAP’s vote? We don’t want to be “vote katwa party”. We are not here to just compete with AAP. They have disconnected with their vote base, therefore, they themselves will put off their voters. We expect women, poor and the middle class to vote for us. AAP did not fare well in Punjab. Do you think MCD elections will be a tough challenge for them? The AAP is quite dismantled. With the loss of volunteers, party leaders, MLAs, it has only turned into a personality-based party. As against Narendra Modi [election mascot for BJP], Kejriwal looks quite a low performer. The road is tough for AAP. 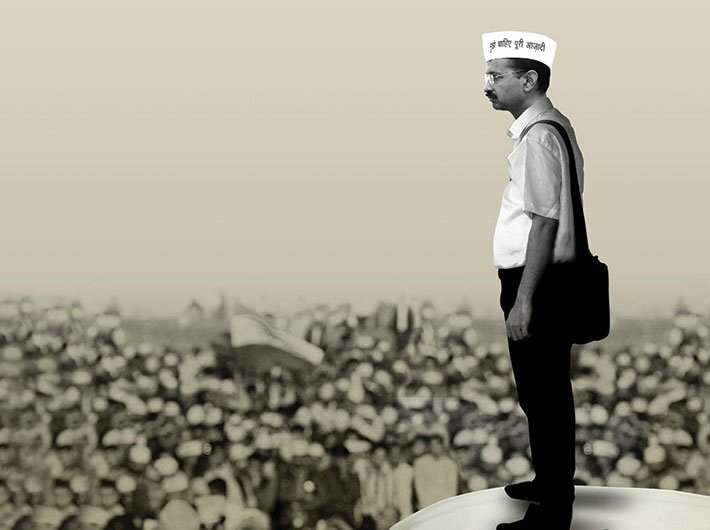 What went wrong with the AAP model of governance? Initially, AAP promised CCTVs, women safety, free WiFi and vouched for accountability, transparency and zero tolerance for corruption. But today the AAP government is the most opaque government in the country. Everything is reduced to blame game between CM and LG, CM and PM. Also, there is no mention of the Lokpal anywhere. Therefore, the AAP model of governance is nowhere to be seen.